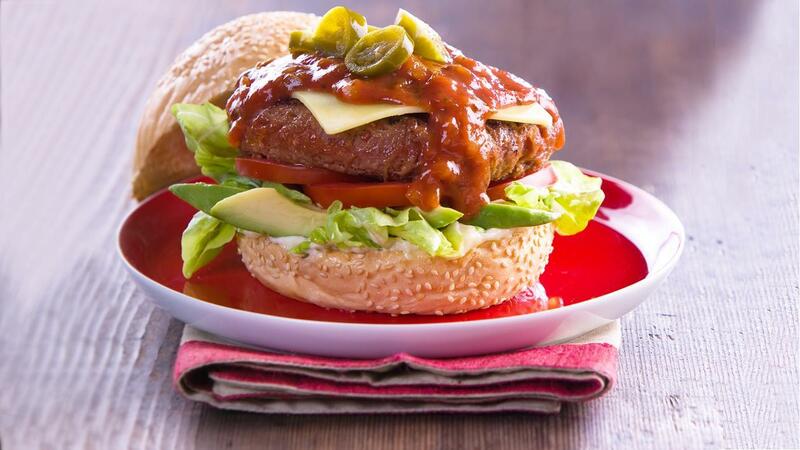 This burger packs a punch - the addition of jalapenos gives the KNORR Mexican Chunky Salsa Mild an extra chili hit. Preheat the oil in a frying pan and pan fry the diced onion until cooked without colour, remove then set aside. Combine the cooled cooked onions with the mince, sausage meat and KNORR Italiana Napolitana Sauce GF Mix, mix together well and form into 150 g patties. Cook the formed beef patties on char-grill until cooked through, remove and keep hot. Toast your burger buns and keep warm. Construct the burgers in the following order-bottom bun, HELLMANN'S Real Mayonnaise, sliced avocado, lettuce, tomato, beef patty, sliced cheese, KNORR Mexican Chunky Salsa Mild GF, sliced jalapeños and lastly the toasted top bun. Serve with fresh cooked shoestring fries.